I’m not here to debate the idea that diamonds are a girl’s best friend. I accept. But I do want to point out that some people of the female persuasion have different notions of best friends (of the material persuasion). Things that, like diamonds, make them light up with joy and excitement. And if you are my mother, those things include roasted cauliflower and eggplant and sweet potatoes, steamed zucchini, and pan fried brussel sprouts. Pretty much anything of the vegetable persuasion. I’m not kidding. So if you want to get her something for mother’s day, be sure to add this Green Bean Casserole to the list. 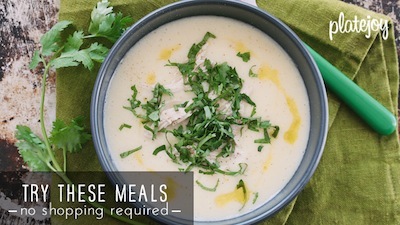 It is very different from her mama’s version, which used canned cream of mushroom soup (avg 800mg sodium per cup), cheddar cheese (avg 700mg sodium for 1 cup shredded), and crunchy onions (60mg per 2 tbsp). And instead includes a velvety mushroom and shallot gravy, pan frazzled green beans, and crispy shoe string potatoes for the topper. 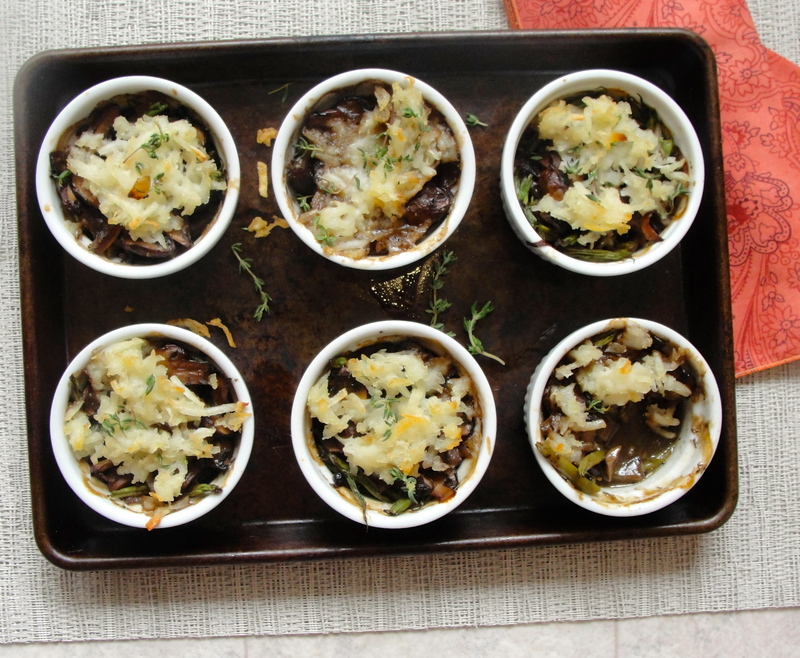 Placed in ramekins, it makes a delightful side dish for brunch or dinner with your favorite mom. And a side of granddaughter never hurts. 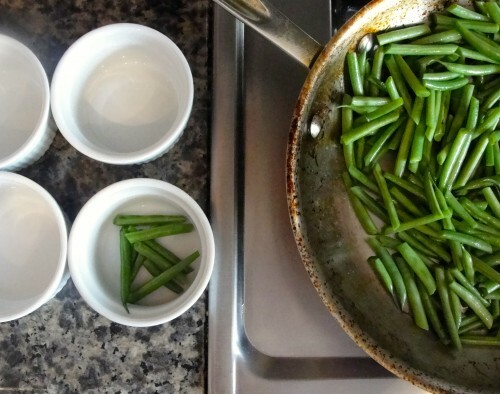 So please go ahead and make the lady in your life blush with these green beans. You can say it was your idea. And celebrate this special day with some of mother nature’s most dazzling ingredients. Cut your shallots in half and then thinly slice them into half moon shapes. In a large pot, add 1 tablespoon of vegetable oil and bring to high heat. When ready, add the shallots to the hot oil and turn down heat just a bit so they don’t burn. Allow them to soften and turn golden, 6 to 8 minutes. Add the mushrooms to the pan, spreading them out. And let them cook until softened and browned, occasionally stirring, for 12 to 15 minutes. Reduce to a strong simmer. Then, add three cups of water to the pot and bring it to a roaring boil, 2 to 3 minutes. Add all the black peppercorns, black pepper, salt-free garlic powder, and smoked paprika. Give it a stir and then let the mixture reduce, without lid, for 15 more minutes. Heat the oven to 425dg F.
Cut the cleaned beans into thirds and set aside. In a large pan, heat 1 tablespoon of vegetable oil. When it’s hot, add the beans and let them sizzle for 5 minutes, turning down heat as needed so that they do not burn. Then give them a quick stir and let them sizzle, undisturbed, for 5 minutes more. 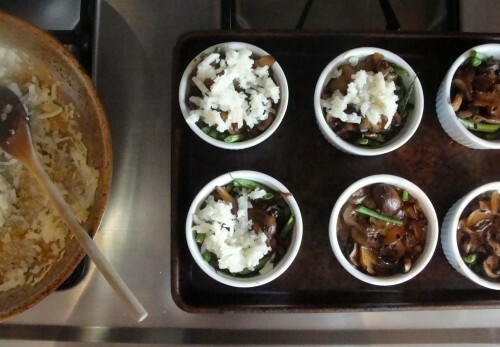 In a small bowl, combine 1 1/2 teaspoons of cornstarch with 3 tablespoons of hot liquid “broth” from the mushroom mixture. Whisk with a fork until the mixture is smooth and there are no clumps (this is called a “slurry”). Add the slurry to the mushroom mixture and stir until combined. Continue cooking and reducing the mixture for 8 to 10 minutes. Add the dried herbs and stir. 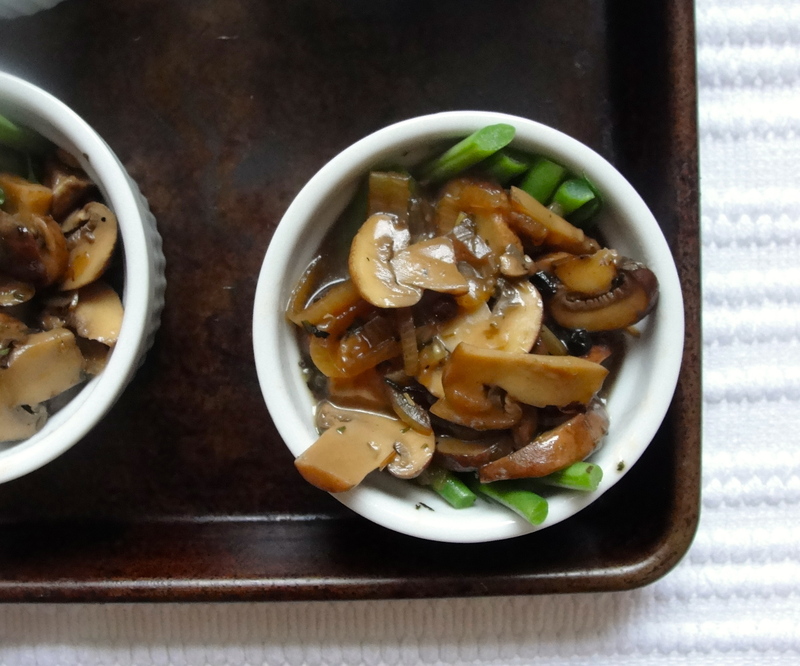 Add the green beans to the mushroom mixture, using a spoon or spatula to mix until combined. Divide the bean and mushroom mixture evenly between 6 to 8 small ramekins, filling them just below the rim. In a medium bowl, mix the hash browns with a few tablespoons of oil (your hands work best for this part). And then top each ramekin with a generous layer of potato. 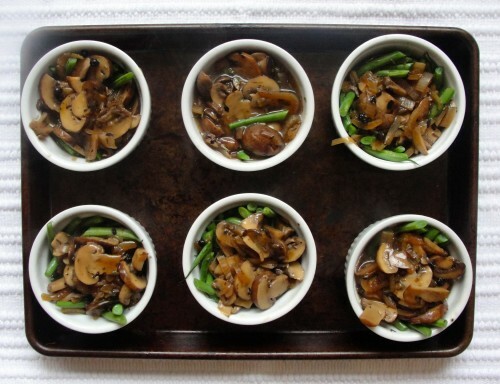 Place the ramekins on a baking sheet and into the oven. Cook for 15 minutes or until the potato topper turns crispy and golden brown. You can always give them a quick blaze under the broiler, on low, for a few well-attended minutes. No oven fires, please. 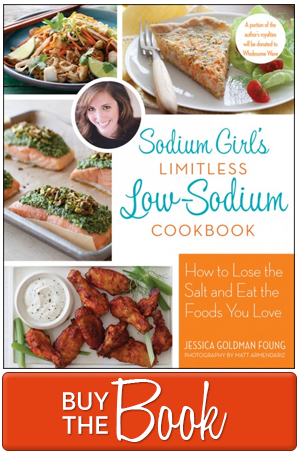 + Sodium Count: French green beans, 33mg per cup; frozen no-salt-added hash browns, 25mg per cup. Hey, You know what? I made it for my mother and she really loved it. Thank you so much for this amazing recipe!! I can’t wait to try this, it looks absolutely amazing! Just looking at the photo makes my mouth water, I hope its as good as it looks! This will be the best gift of the mothers’ day. 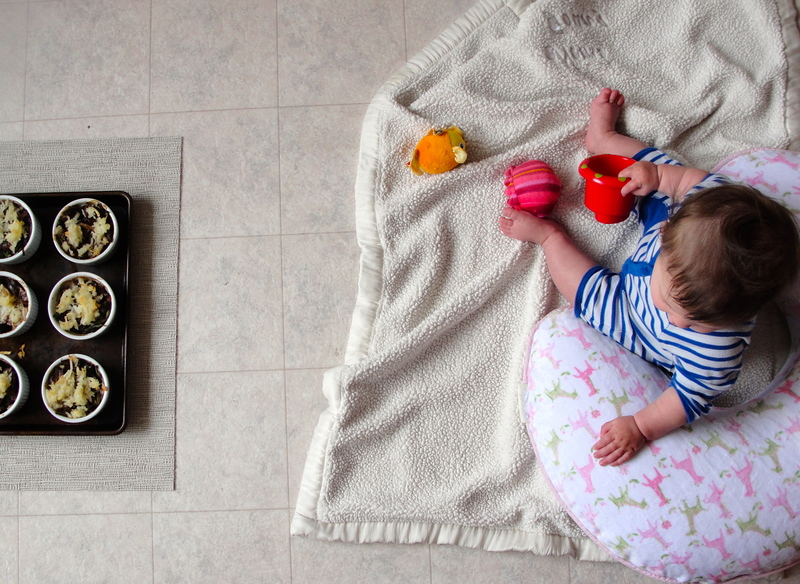 It’s very easy to cook. I will not wait for next mothers’ day; I will cook today for my mother, hope she will love it. I would never think of making them this way. I am visiting my dad tomorrow so I wii try to get him few of those. Hopefully they will be alright if I will warm them up in oven before serving.